…I could not be happier with the craftsmanship, meticulous construction process, and final product. Richard and his team built my pool as if it was their own. They were available to meet and talk at any time, and throughout the whole building process…We also enjoyed being treated so kindly during and after construction. Serving Southwest Florida homeowners, Blue Haven’s seasoned swimming pool professionals build custom inground pools & spas and complete backyards with a myriad of design features. From fire bowls to swim-up bars, you have many design choices when buying a pool: Your new aquatic resort can include a patio or lanai, or outdoor additions like a travertine paver deck, island barbecue, and screen room enclosure. 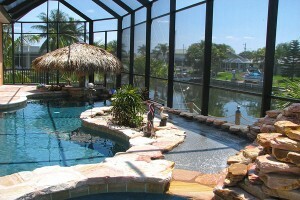 What will also distinguish your Blue Haven pool is its interior surface. We don’t use typical marcite plaster Even our basic package includes PebbleTec® brand Pebble Fina. This color aggregate material delivers real benefits; its extra dense, etching-resistant aggregate ensures a distinctive, smooth-on-your-feet, long-lasting interior for years to come. We pair great technology with a pool design tailored for your home, backyard, and family lifestyle. Our state-of-the-art pool technology is exclusive and delivers maximum enjoyment with minimal effort. In particular, you will appreciate our multi-speed pool pump. This fuss-free, fully automated wonder operates your pool while ensuring superb energy-efficiency. Expect rock-solid experience from our local Blue Haven office. General Manager Richard Durling brings more than two decades of hands-on, well-rounded industry expertise in custom pool construction, design, and operations management. Starting out in the trenches—quite literally—Richard began his career in the industry as a certified plumber. He laid gas and plumbing lines and installed pool equipment for various pool builders. That was back in 1995. Later, he joined the Blue Haven Pools team on a full-time basis, where he transitioned into a design position. Over the years, Richard developed detailed poolscape plans for hundreds of clients with a diverse range of needs and preferences. Addressed a range of routine and special needs for client. Formed partnerships with local home builders. Performed a variety of administrative functions. Richard even launched a separate pool-service division. The operation provided weekly cleaning service, startups for new pools, and warranty repairs for a range of pool equipment. During Richard’s tenure, the Blue Haven office he helped manage gained an outstanding local reputation and a continuous A+ rating with the BBB. As the general manager for the Naples/Fort Myers office, he continues to apply his deep, diverse real-world industry skills and knowledge to ensuring quality pool projects and homeowner satisfaction.